When this card is Normal Summoned: You can excavate the top 3 cards of your Deck, and if you do, you can add 1 excavated “Salamangreat” card to your hand, also shuffle the rest into the Deck. 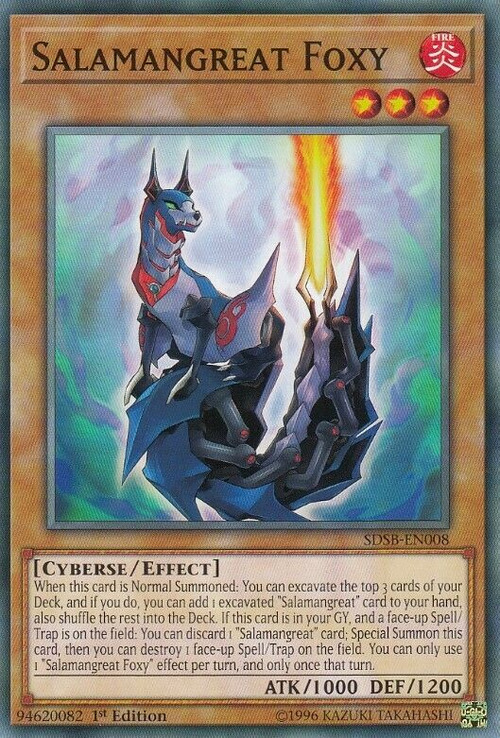 If this card is in your GY, and a face-up Spell/Trap is on the field: You can discard 1 “Salamangreat” card; Special Summon this card, then you can destroy 1 face-up Spell/Trap on the field. You can only use 1 "Salamangreat Foxy" effect per turn, and only once that turn. 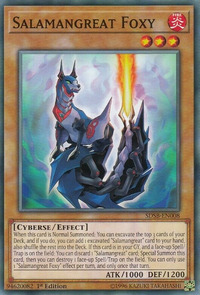 This card has a female counterpart: Salamangreat Foxer.